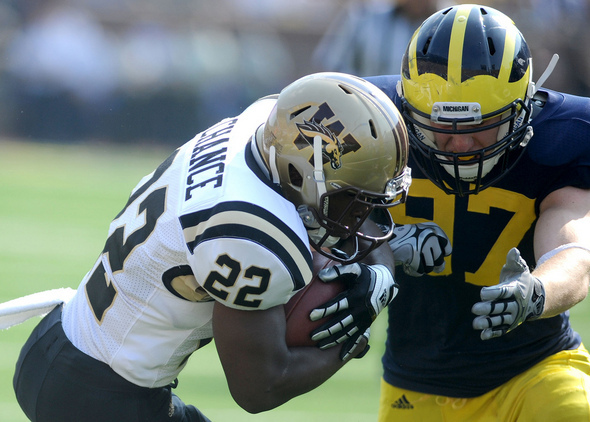 Posted on Mon, Oct 24, 2011 : 4:12 p.m.
Michigan defensive end Brennen Beyer, one of five freshmen who drew praise for their off-week practice performance, makes a tackle on Western Michigan running back Dareyon Chance earlier this season. Some players spent the Michigan football team's off week getting healthy. Five freshmen spent it vying for more playing time. When asked if there were players who could be expected to receive a boost in snaps after the off week, Hoke immediately listed defensive end Frank Clark and cornerbacks Blake Countess and Raymon Taylor. He later added strong-side linebacker Brennen Beyer to that list. Players also noted that another freshman, running back Thomas Rawls, saw an increase in snaps during off week practices. Countess' rising status is not a surprise, as he has played well since getting his first shot on defense against San Diego State. He did not start against Michigan State, but did replace senior cornerback Troy Woolfolk on the first series and played the rest of the way. The freshman is expected to challenge for that spot, although he remains slotted behind Woolfolk on the depth chart for the game against Purdue on Saturday (noon, ESPN2). Clark and Beyer, on the other hand, appeared to be longer shots to crack the two-deep, although Hoke now seems to be particularly impressed by their growth. He mentioned several times they were the leading candidates for more playing time in the team's final five games. Senior defensive tackle Ryan Van Bergen said Clark and Beyer showed superior athleticism and potential in fall camp, but it was their high school coaching that led him to believe they would be contributors this year because it put them so far ahead in picking up the schemes. "Schematically, they were able to figure out things relatively quickly, as fast as you can expect a freshman to pick it up," Van Bergen said. "So, we were ready for them to contribute — it just got to be a point of can we trust them to do all their jobs. "When you’re an 18-year-old kid playing against 22-, 23-year-olds, that can shake you a little bit, but those guys have shown they have what it takes to compete at the highest level." Hoke has lamented his depth at several spots in recent weeks, most notably up front. The emergence of Beyer behind starter Jake Ryan and the injured Cam Gordon at strong-side linebacker would be insurance there. Clark's ascension behind Craig Roh and Jibreel Black at defensive end is just as important, as coordinator Greg Mattison likes to cycle through his linemen. Long term, that also could free up Mattison to have Roh or Black take snaps at the other end position, which has been a weakness for much of the year, rather than have them split time on the strong side. "Coach Mattison has always been a firm believer in 'the more guys you can get in the game, the fresher you can keep guys,'" Van Bergen said. "He’s getting more confident in (Clark and Beyer), so you’ll definitely see more from them as the season goes on." Clark, from Cleveland, has played in six games this year and recorded three tackles. Beyer, who played at nearby Plymouth High School, also has played in six games -- including some extended time in Week 2 against Notre Dame -- and recorded five tackles. Hoke did not mention Rawls with the other four freshmen, but senior tight end Kevin Koger said the Flint native has received more snaps in practice and is closing in on cracking the rotation. "You could look for him to contribute a lot more this season," Koger said. "He's another hard runner. He's a bigger back, as you can see, but he was running hard in camp before he had that shoulder injury, which set him back a little bit." Rawls has received 12 carries for 78 yards in four games this year. Koger said the biggest thing holding him back from getting more snaps is learning more of the offense. Sophomore Fitz Toussaint and junior Vincent Smith have received the bulk of the carries this year from the tailback position. Sophomore offensive lineman Michael Schofield has impressed the staff as a reserve because of his versatility. However, he now has started four games for starting left guard Ricky Barnum -- first in the opener, when Barnum was suspended, and now the past three games, with Barnum out with a twisted ankle -- and has become a legitimate contender for more playing time. Hoke said that although Barnum now is "healthy," there is competition at the left guard spot. He later said those two also could compete for playing time with Patrick Omameh, who has struggled in recent weeks at right guard. The right side of the offensive line has been a weakness in recent weeks, so bumping a man from left to right could be a possibility. At the very least, though, Schofield's growing role will help mitigate Hoke's concerns about depth up front on offense. Sophomore left tackle Taylor Lewan is slowed by ankle and wrist injuries and did not practice last week -- the team went through drills Tuesday, Thursday and Sunday -- but Hoke said he expects him to play against Purdue. Hoke typically uses Tuesday and Wednesday practices as a barometer for game time, so those will be important days for Lewan to show he's healthy. Woolfolk, who has sustained several injuries this season, most prominently a sprained ankle, ran well Sunday in practice and should be available against Purdue. He also tweeted on Saturday that he was involved in a seven-car accident, but Hoke said "he looked fine" at practice Sunday. Gordon, who has played only one game this season (on special teams against Michigan State) because of a back injury, finally has been supplanted as the starter on the strong side. He had been listed ahead of Ryan all season, although Ryan had started every game at that spot. Ryan now officially is listed as the starter. Tue, Oct 25, 2011 : 10:49 p.m.
Countess seems like the best corner out there when he is playing. I'd like to see Rawls used in short yardage situations more,were we seem particularly inept. against a big front. Tue, Oct 25, 2011 : 7:56 p.m.
A comment was removed because it violated our conversation guidelines. Please do not post comments in all caps. Thanks. Tue, Oct 25, 2011 : 4:57 a.m.
Tue, Oct 25, 2011 : 3:52 a.m. Very interesting. Um has the meat of the conference season upon them and now Hoke decides to give some true Freshmen playing time and not redshirt them. Must be that with four Freshmen already leaving the program Hole feels pressure to give the kids the playing time he promised them when they were recruited. With more scholarships opening it looks like another of many big recruiting classes for um. Still Hoke can't take anymore true Freshmen departures. Will Hoke tank the season just to let the Freshmen play? This should have been done before conference play but he was more interested in running up the score than let Freshmen play. Purdue is no gimmee but um should win. The last four could get ugly. Mon, Oct 24, 2011 : 8:49 p.m.